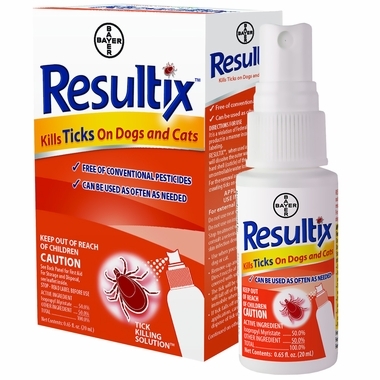 Resultix is a fast acting, tick killing spray for use on dogs and cats. For immediate relief, simply spray attached or crawling ticks until covered (usually two sprays). Resultix dissolves the outer waxy layer surrounding the tick's hard shell, causing uncontrollable water loss. Within 3 hours from application, the tick will die and fall off your pet or will become immobilized, making it easy to remove. By using Resultix, you will minimize the amount of contact you have with live or mobile ticks. Resultix is free of conventional pesticides and can be used as often as needed. One bottle contains about 200 sprays. Stop ticks early to prevent them from transmitting diseases such as Lyme Disease, Rocky Mountain spotted fever, and Babesiosis. Remove the cap and hold the bottle upright. Direct the nozzle at the tick and spray until the tick is covered (usually 2 sprays). The tick will die within 3 hours and either fall off your pet, or be immobile when removed. If the tick falls off indoors within 3 hours of application, carefully pick up and dispose of tick using gloves or tweezers. After 3 hours if the tick has not fallen off, remove carefully with gloves or tweezers and dispose of tick. Dispose of ticks by placing in a sealable plastic bag, sealing the bag, and placing the bag in an outdoor garbage can. Wash hands thoroughly if you accidently came in contact with ticks. Tip: Always use gloves and tweezers when dealing with ticks. Use as often as needed. Spray until the tick is covered (usually 2 sprays) and wait 3 hours until tick falls off. If tick does not fall off within 3 hours, remove tick with gloves and tweezers. Do not spray near pet's eyes. May cause skin and eye irritation. Avoid contact with skin, eyes, or clothing. Wash hands thoroughly with soap and water after handling and before eating, drinking, chewing gum, using tobacco, or using the toilet. Do not use near pet's eyes. When you see a tick on your pet, remove the cap and hold the bottle upright. Direct the nozzle at the tick and spray until the tick is covered (usually 2 sprays). The tick will die within 3 hours and either fall off your pet, or be immobile when removed. If the tick falls off indoors within 3 hours of application, carefully pick up and dispose of tick using gloves or tweezers. After 3 hours if the tick has not fallen off, remove carefully with gloves or tweezers and dispose of tick. Dispose of ticks by placing in a sealable plastic bag, sealing the bag, and placing it in an outdoor garbage can. Wash hands thoroughly if you accidentally came in contact with ticks. May cause dermal and eye irritation. Avoid contact with eyes, or clothing. Wash thoroughly with soap and water after handling and before eating, drinking, chewing gum, using tobacco, or using the toilet. Take off contaminated clothing. Rinse skin immediately with plenty of water for 15-20 minutes. Call a poison control center or a doctor immediately for treatment advice. Hold eye open and rinse slowly and gently with water for 15-20 minutes. Remove contact lenses, if present, after the first 5 minutes, then continue rinsing the eye. Call a poison control center or a doctor immediately for treatment advice. Move person to fresh air. If the person is not breathing, call 911 or an ambulance, then give mouth-to-mouth resuscitation. Call a poison control center or a doctor immediately for treatment advice. Call a poison control center or a doctor immediately for treatment advice. Have person sip a glass of water if able to swallow. Do not induce vomiting unless told to do so by the poison control center. Do not give anything by mouth to an unconscious person.